Should I study one language at a time, or many? The language dilemma: learning multiple languages at once or one after the other? The process of acquiring a language is a personal pathway and unfortunately, due to its complexity, there is no one-size-fits-all type of answer to this question. However, we will try to shed some light on the factors that may influence each individual, the possible pros and cons of simultaneous language acquisition, and how to improve your education environment. With the growth of globalization and the increase of population movement across the planet, being able to communicate emotions and ideas with one another in an effective manner seems more important than ever. In that light, speaking more than one language is not a fad but a modern necessity! But before embarking on any language learning project, reflect on your personal motives. Are you moving countries, are you dating a foreigner, or are you constantly traveling for work? Why do you want to learn, improve, or practice a new language? Having a clear WHY will help you stay motivated on your own path and create time in your busy calendar for this stimulating activity. Everybody can learn a new language. Yet, it is a holistic process, unlike practicing musical instruments or training for sports. Linguists, psychologists, sociologists, and educators provide plentiful (and sometimes polar opposite) perspectives on multilingualism and second language acquisition. Be reassured that any adult, teenager, or kid can learn every language. The theory that the window of opportunity to grasp a new language shuts after the teenage years has been overruled! It is just that from a neurological point of view, adults and children use different parts of their brain through the language learning process. 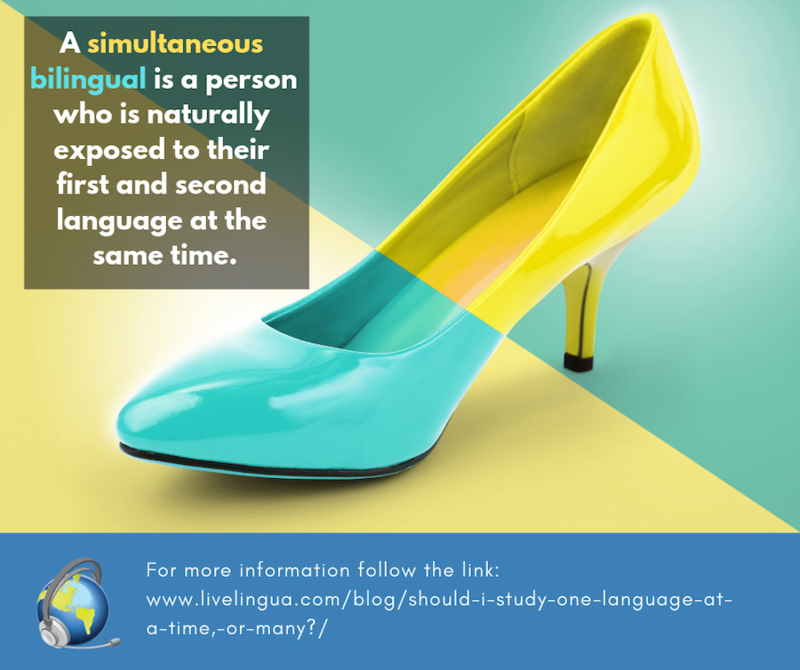 A simultaneous bilingual is a person who is naturally exposed to their first and second language at the same time. This would be the case of a baby whose parents address him or her in different languages, or a young child who is being raised in a community where a dissimilar language to his family at home is spoken. This baby is likely to become a native speaker of both languages. Conversely, a sequential bilingual develops a second language after the first (no matter the age); in which case, the second language is acquired as a foreign language and not as a native tongue. For example, a Chinese native speaker who is learning French at high school or a British granny trying to learn Spanish because her son married a Mexican girl. Balanced bilingualism is rarely obtained though. Usually, bilinguals are more competent in one language as a consequence of their culture, religion, economics, technology, or education. This term refers to a person that takes lessons of two or more languages dissimilar to their mother tongue at the same time; like a native Italian speaker who would like to polish his Russian and learn Japanese at the same time to improve his work opportunities within their company. Learning multiple languages at once can be achieved under the right conditions. Results from a study of a small group of adult Persian-speaking learners concluded that simultaneous language learning, English and French in this case, can be attained if it is scientifically programmed. These Iranian researchers from the Tarbiat Modares University created a friendly environment to reduce anxiety and stress and used simple strategies to establish clear visual differentiators: distinct classrooms for each language, diverse color markers, and opposite teacher’s gender. Define your motivation by recognizing your true desires. Make time for it, creating the energy and the mental space. Choose the right language pairing or the correct languages for you. To find out which are the best languages for you, seek professional advice from a qualified language school. They will be able to guide you by taking the factors previously described into account and design a personalized language learning program. Interestingly, there is no universal criterion as to what degree of language competence is necessary to be recognized as a bilingual or a multilingual person. In any case, learning foreign languages is a continuum process, because you move from zero knowledge to the desired competency of a native speaker. It is common for all kinds of language learners to merge properties (such as grammar and phonetics) from their first language with their second language. This is known as transfer and there is a hefty body of scientific literature about its positive or negative effects. Some argue that transfer has an enhancing effect, others say a debilitative effect, some even state that it has no role in the language learning process at all. We can conclude, then, that it depends on your own cognitive skills, your level of proficiency in the languages you already speak, your chosen learning environment, and the similarities between the studied languages. The “obvious” advantage of simultaneous language learning seems to be time but there are no guaranteed shortcuts. If you are working with a tight schedule or you are already a polyglot then it may be a good idea to pursue simultaneous learning. 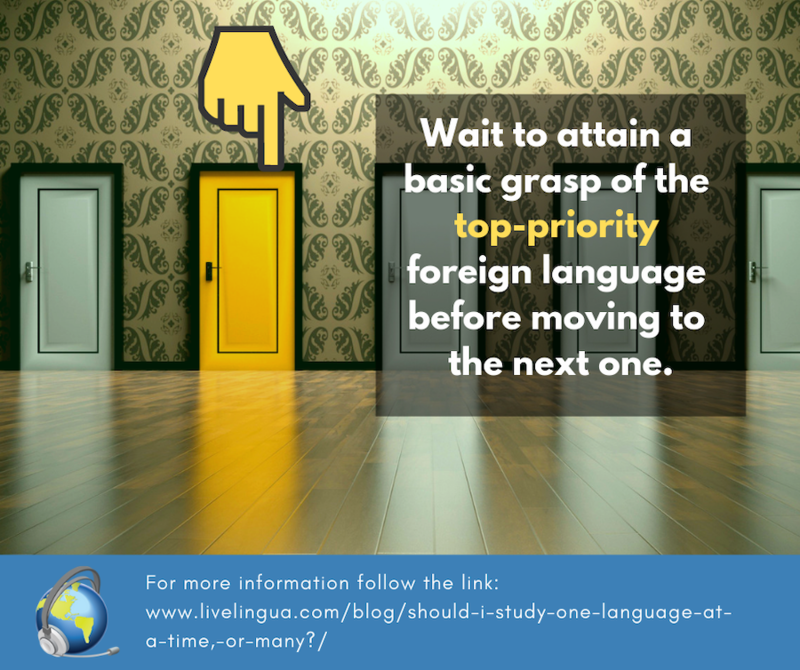 Otherwise, wait to attain a basic grasp of the top-priority foreign language before moving to the next one. 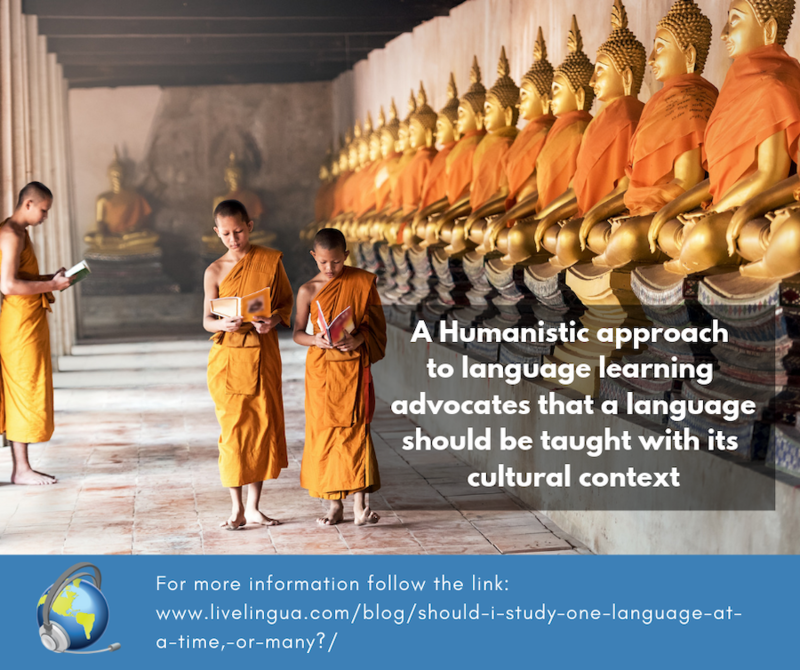 A Humanistic approach to language learning advocates that a language should be taught with its cultural context; where the religious beliefs, social values, political views, customs and traditions of the linguistic group that is studied have a place in the course. This can be done by taking language lessons with native speakers who are keen to bring their cultural insights onto the table. In addition, new findings from neuroscience also suggest that an immersive environment is key for successfully learning a foreign language in adulthood; along with extensive repetition, practicing the language in various contexts, and attaching emotion to the lessons to enhance memory functions. Increase your chances by improving your education environment. Choosing an immersion language school that offers personalized lessons delivered by native speakers who adapt to your cognitive style is really a smart move!